Home » Blog»News » Dancing With The Deus! 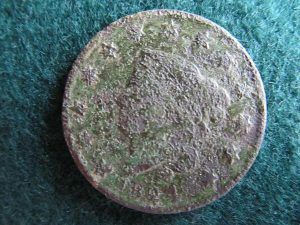 I had been a Minelab guy for quite awhile, first E-Trac and then with CTX. While I have had great success with these machines I am not averse to trying out other machines as well. My belief is that most of the major manufacturers can and do make quality products. I had been following my friend Todd Yerks and how he was having great success with his Deus I was quite intrigued on how it may help me find more in my field permissions. After some conversation with him and watching many of Gary Blackwell’s videos I came to believe I wanted to try it, but wanted to have a bit of hands on experience with one before making the plunge. My major concern would be could I learn the tones and what they were telling me. My first experience with a Deus was with a borrowed machine, my friend Tom Johnson let me borrow his detector to try out, I had heard great things about the Deus from my friend Todd (CtTodd), Yerks and with his tips and Tom’s machine I quickly learned the great properties of this wonderful detector. 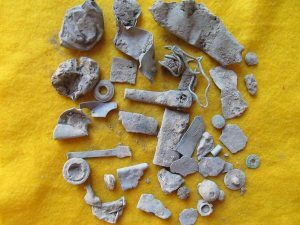 I took it out to a field that had given us many nice finds but like all fields after awhile the finds slow down. I turned it on and was amazed at how light it was and how easy to swing. 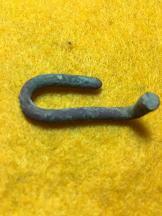 I encountered my first target it gave a solid tone….but something seemed a bit off as when my coil came off the target I could hear an iron buzz…now was this a good target next to iron, I did not know but my experience told me it was most likely some rusted iron so I dug it and was glad to know I was correct. Now it may sound strange to be happy to dig some iron but I was pleased that I felt I could understand this machine. 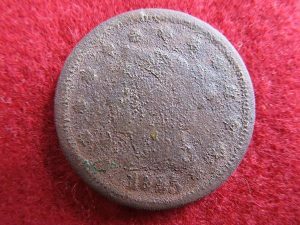 Next target was a definite high tone and not iron but I sensed that it was not a coin, perhaps a button but did not sound quite “round” a little crackling edge to it made me think a deformed head stamp. Diane was close by so I asked her to check it with her E-Trac and she got a 12-25 – 12-26 signal which could be a button, a Fatty Indian, or a piece of Harmonica reed…I asked her what she thought she replied “I don’t think it is coin or button but I would dig it” which I of course planning on anyway. It turned out to be a Head Stamp. 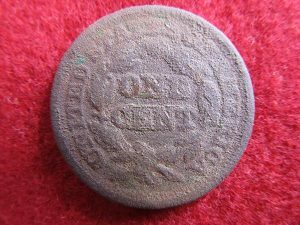 A bit later I got a very nice solid 93-95 TID and a sweet tone…and I thought…Large Cent! 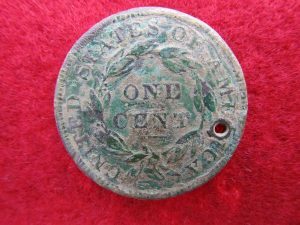 I dug the target and using my pinpointer I quickly found it…indeed a Large Cent. 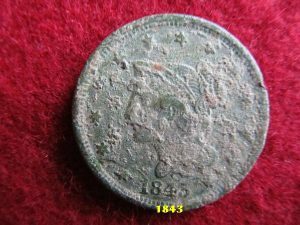 A crusty 1845, time was short so we left. What I learned was that without doubt I could understand the Deus, and I knew more was to come! After finding a Large Cent with a borrowed Deus I decided it was time to get my own, it was not until February 2017 that I was able to purchase it. My goal to test it out was to go to fields where we had pounded hard with our other machines and or fields that were typically difficult to hunt. The first field was one that has given us many things and that the signals were getting very scarce. I found a few bits of things including a CW Jay hook missing the button. 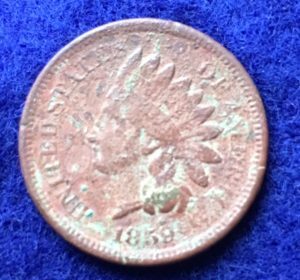 The next field we went to is one that has given us nice things but one in which you had to work for every signal as the soil is demanding, there I got a super toasted 1863 Fatty Indian. I was now feeling I made a good decision. The next spot I decided to go dancing with the Deus is one of my favorite fields, we have found so many great items there and I was hoping to find more. 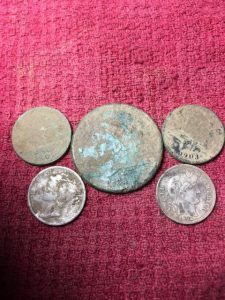 I decided I would go back over a portion of the field that was very iron infested, granted we had found things in this section but it was not a fruitful as other portions have been. I was swinging and I heard a small blip of a high tone surrounded by iron, turning 90 degrees I was able to replicate the signal. 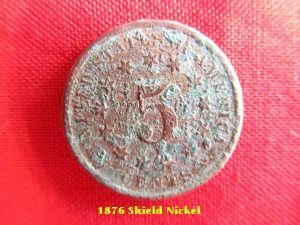 I decided to dig this target since most everything we have found in this field has been old. I just had a feeling that this would be something good. I dug my plug and swung over it again and the target was still in the hole taking some more dirt out I was now at 4+ inch depth. 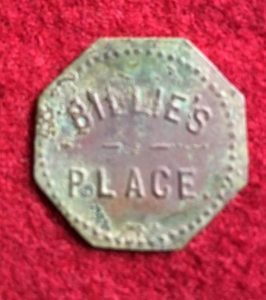 It took me awhile since the target seemed small…and small it was a small silver disk. 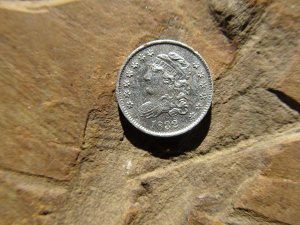 I called Doug and Diane over to see it and as of yet I did not know what it was…I said “I don’t know what it is but it sure looks like Silver” Doug replied, “I know what it is…it’s awesome!” When I got it out I knew it was Half Dime size but what kind of Half Dime. 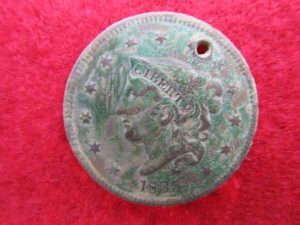 Apply some water the sticky clay slowly came off and then I said “It’s a Capped Bust Half Dime!” and indeed it was an 1832! I now knew for sure that this machine is a killer in the iron! Just a few minutes later I got a nice signal in this same area and out popped a Large Cent! 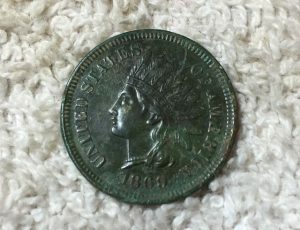 So I now knew that this machine is a real keeper! I continued to go to fields that we had hunted before trying to squeeze more out of. Now I was still learning the Deus but my confidence grew with each hunt. 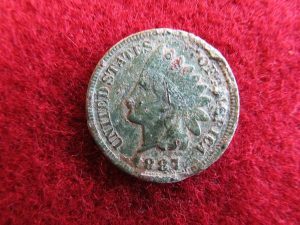 Another one of our good fields now gave up another good find, another Large Cent and that motivated me all the more to hit other of our permissions. And I stress these were all fields that we had not been finding much at recently. 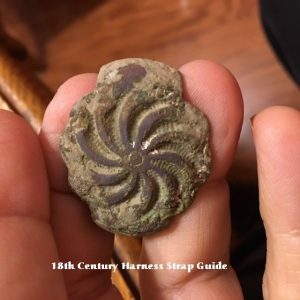 Here are some of the things I found. Nearing the end of field season I found a new site so I was curious how the Deus would do in this field, I was not to be disappointed as my first hunt was stellar. What a great hunt! 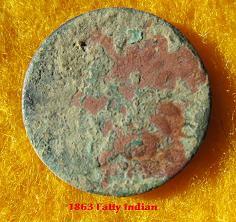 My first target was an Indian Head and the nice thing was I was confident that is what the target was going to be! Just a few minutes later another Indian Head signal and this time I barely looked at the TID as the sound was the same as before. 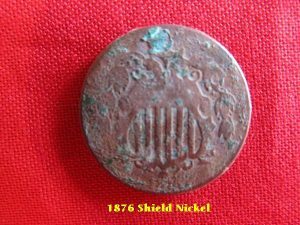 Then the sound of a Big Copper rang in my ears and again I was thinking Large Cent….with every target I dug I was learning more and more what this detector can do! 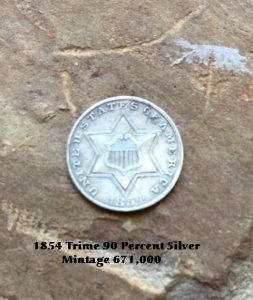 About 10 minutes later I got a sweet sounding target, peeping at the number I saw a 93 staring back at me…my first thought…Silver! And that is what it was a Barber Dime! Not far from that spot bam! 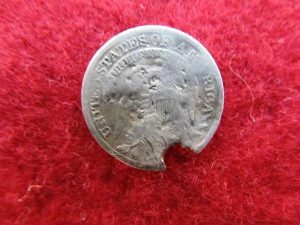 I again got that high tone…and I knew it was another Silver…this time it was a Mercury Dime a 1916 alas not the D mint mark but still a welcome sight to see emerge from the ground! Not to neglect relics that the Deus finds for they are always welcome too. 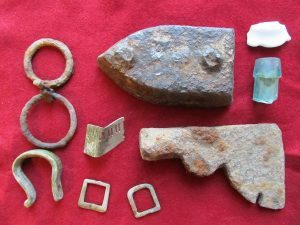 Here are some of the relics I found and other “treasure” too! A few days later we returned to this site and again I was amply rewarded. 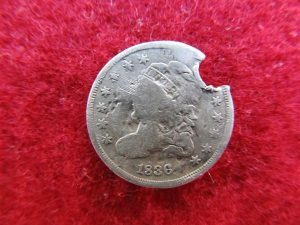 This time it was just two old coins, one an 1880 Indian Head and amazingly another Capped Bust Half Dime! Gosh the Deus loves these little tiny Silver! 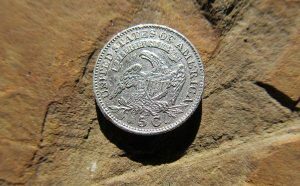 The Little Half Dime was a bit damaged but who could complain! Field season was coming to a close as more of the fields were being planted I had one more opportunity to get out to a field and again the Deus did not fail me. 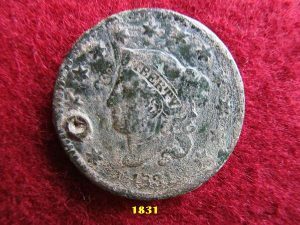 An 1835 Large Cent with the variant of having the 1836 Bust! I was looking forward to the start of field season but fate intervened, a reaction to some prescription medicine cause me to end up in the Hospital for over two day and when I was finally discharged I was as weak as a kitten. 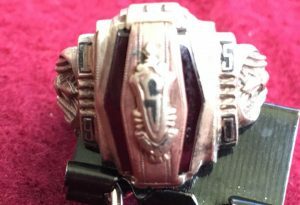 So I got a late start on the fields I got out one time and did find on my first hunt a Gold Class Ring…normally don’t find gold rings in farm fields so I was very pleased of course! So I was very eager to see what I could do with the Deus when more of my permission fields were harvested. Again life had something else in store for me, our club put on a demo and display for the local park district and I had brought many of my frames with relics to show. The demo where we helped kids to learn about detecting and the ethics involved went very well and there was much interest in my displays and I answered many questions about what things were and how to find and get permission to detect. When the event was over I packed up my displays and made two trips to the car carrying the heavy bags of them. It was a short drive home and when I got there I could barely get out of the car and walk, somehow I aggravated the Sciatic nerve in my right leg. It was a painful six weeks of treatment and rehab before I could even walk for an hour. The weather was beautiful and it was killing to be stuck at home. At last I felt good enough to try to detect, I had secured a new permission that had three sites on it and fortunately one of the sites was very near the road so I could park and be right on site. I was very thankful for the lightness of the Deus as it was taking all my energy just to walk. We got to the field and under the watchful eye of my wife Diane we started detecting. 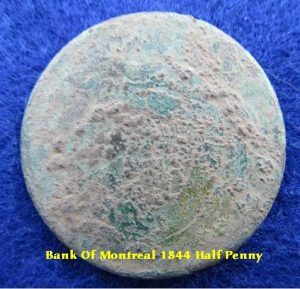 I had been there about five minutes when I got a nice signal and was extremely pleased to dig a big Copper, it was very toasty and only later was I able to tell that it was a 1844 Bank of Montreal Half Penny Token! 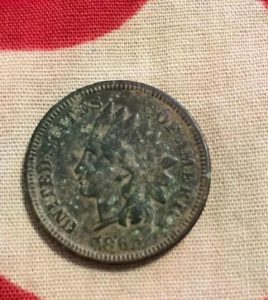 A few minutes later I got another signal and dug a 1904 Indian Head Cent. I had to quit then my leg was aching so bad but my spirit was feeling so good! I was looking forward to the next time I could get out again. Each time we went out I could stay a bit longer, so we hit the sites in this field since it didn’t require a lot of walking to get to the sites in it. I really would not have been able to detect as long as I did if I had one of my heavier machines so that was a blessing. 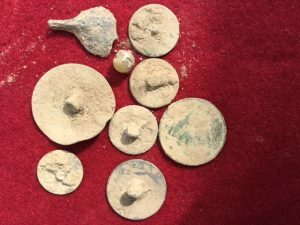 I was able to make some good finds in this field including relics, tokens and buttons etc. 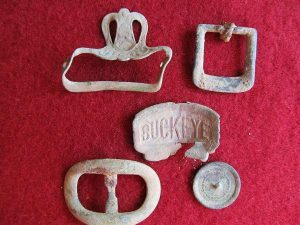 here are examples of some of the finds. 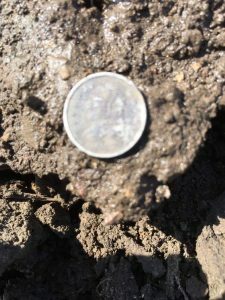 As the crops were quickly being planted I was eager to get out one more time we went out and found one of our fields still available and I was hoping to end the season with one more good find. And I was not disappointed! 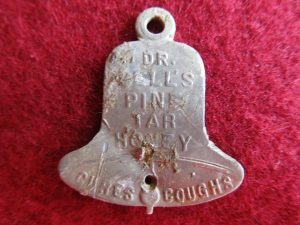 We had been at this field for about an hour and while Diane was doing well, with an Indian Head and a 1857 Flying Eagle I was just digging odd bits of brass and copper I heard a small high tone amongst the iron and narrowing my swing I was able to pinpoint the spot. 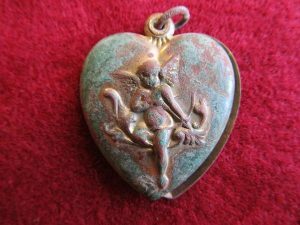 I dug my plug and when I stuck the pinpointer in the hole I could hear just a small beeping, I could tell it was a small target and at first I was afraid it might just be a small piece of brass or copper. 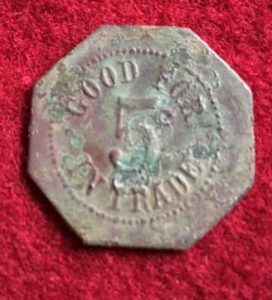 I pulled a small clod out and the pinpointer told me it was in this clod I popped it and I saw a Silver edge…a very small Silver edge another pop and I could tell this was a coin! 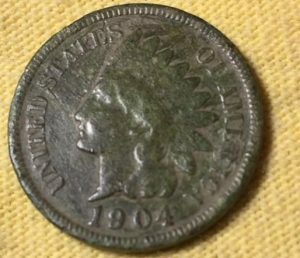 I saw the III on it and I knew I had dug a long desired coin, a Trime! 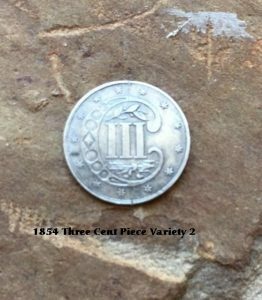 A Silver Three Cent Piece….a coin that had eluded me for all these years…so last hunt for this season…but a great motivator for this fall. Can’t wait to see what is to come!